Chapter 1 reviews recent progress in aryne cycloaddition reactions. The important contributions to the methodology of preparation of arynes in mild reaction conditions are described. Among them, the in-situ generation of arynes via the reaction of ortho- OTMS aryl triflates with fluoride ions is the most applicable. By this method, a variety of arynophiles was employed in the synthesis of nitrogen and oxygen containing 5-7 membered heterocycles. Instructive examples of applications in the total synthesis of natural products (radermachol, (±)-tylophorine, calothrixins, tubingensin B, (+)-hinckdentine A, cossonidine and (methyl)teretifoliones B) are presented. The importance of O-trimethylsilylaryl triflates and fluoride ions methodology for aryne generation is demonstrated in preparation of bioactive molecules and their applicability in medicinal chemistry research. Chapter 2. In addition to thermal reactions, photocycloaddition reactions are a complementary tool in synthetic organic chemistry. The employment of photochemical cycloaddition reactions proceed through different reaction mechanisms and provide access to products which could not be obtained in classical reaction conditions. This chapter is a review of excited state transformations of heterostilbenes to polycyclic structures featuring bicyclo[2.1.1], bicyclo[3.1.0] and bicyclo[3.2.1] moieties. Alongside the main products of these types, often unexpected transformations take place. Some of the photocycloaddition products display interesting biological activity. Chapter 3 reports the results of original scientific research with regards to the application of click reactions in the synthesis of 1,4-disubstituted 1,2,3-triazole conjugates with ribofuranosides and reversed nucleosides. An efficient method for the synthesis of 1,2,3-triazole bridged glycoconjugates with potential biological activity is described and fully supported with the 1H and 13C NMR spectroscopy of novel products. 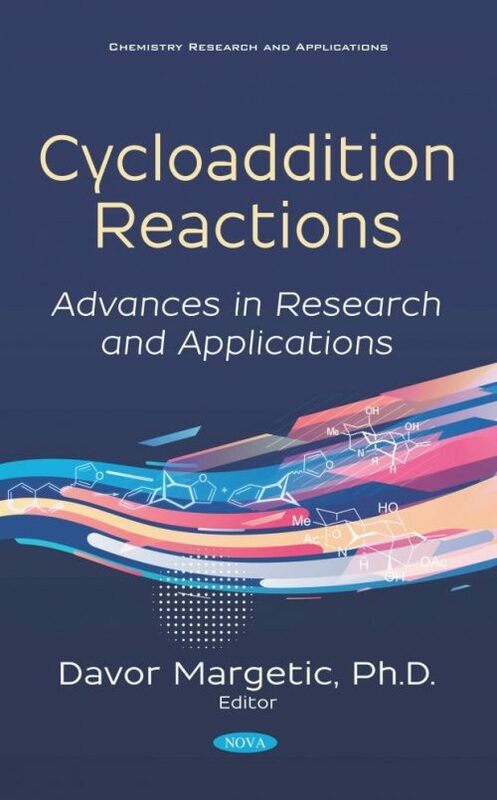 Chapter 4 is a comprehensive review of isocyanide-based cycloaddition reactions. This functionality is highly reactive and participates in many different cycloaddition reactions and annulations. Employment of isocyanide cycloaddition reactions led to the preparation of diverse heterocyclic structures, including asymmetric ones and their applications in medicinal chemistry, in the agricultural, chemical, and supramolecular fields, as well as in the materials sciences. Chapter 5 gives a review of the synthesis of 1,5-benzodiazepine-2,4-dione derivatives via 1,3-dipolar cycloaddition reactions. Functionalization of 1,5-benzodiazepine-2,4-dione by the cycloadditions of nitrilimines, nitrile oxides or azides led to diverse heterocyclic substitutions at positions 1, 3 and 5. Molecular structures of novel products were confirmed by X-ray crystal structure analyses. Chapter 6. Nitrile imines, nitrile oxides and azides were employed in 1,3-dipolar cycloaddition reactions with allyl and propargyl substituted 1,5-benzodiazepine, quinoxaline-2-thiones, benzimidazole and isatin to afford derivatives with heterocylic substituents: pyrazol, isoxazol and triazol. Single crystal X-ray studies of novel products were described, and their biological activity was also reported. Chapter 7. Guanidines are commonly occurring in nature and constituents some natural products with cyclic structures. Various cycloaddition reactions leading towards cyclic guanidine structures were reviewed. The review also summarized cycloaddition reactions in which functionalized guanidines were acting as the reaction partners.